The clever sachet with extreme whitening power: HEITMANN Laundry White cleans your laundry down to the fibre, works on all types of stains, and ensures long-lasting freshness. Your laundry will shine brilliantly white again. The Laundry White for all types of fabric, with the exception of wool or silk. Can be used as a washing power booster and for pretreatment. Make your clothes shine in an extreme white again. HEITMANN Laundry White in the practical single-use sachet removes greyness, stains, and yellowing. Moreover, the multi-active oxygen contained in the product cleans down to the fibre and ensures long-lasting freshness. 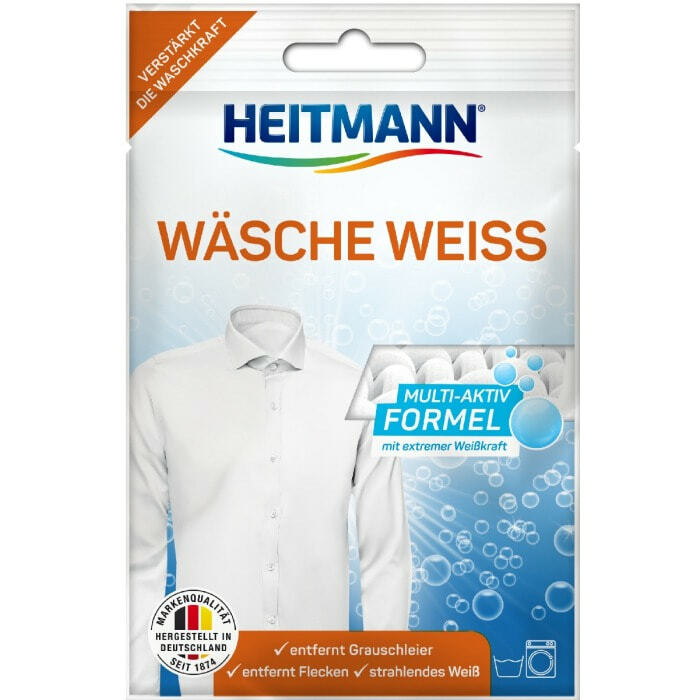 HEITMANN Laundry White is suitable for all washing temperatures and detergents. Easy to use, big impact: bring back a radiant white. Make greyness, stains, and yellowing quickly disappear with HEITMANN Laundry White. You love soft, beautifully white laundry? Then discover the various Laundry White products from HEITMANN. Fill a bowl with seven litres of water. Dissolve the contents of the sachet and the detergent. Then soak the laundry for at least an hour and wash as usual.